Along with the Indian economical growth, there has been a rapid expansion in the productivity and research in Indian pharmaceutical industry, justifying the need of quality pharmacy education. NSHM College of Pharmaceutical Technology (NCPT) fulfils the need of the society by creating industry-ready professionals. Situated in the metropolitan city of Kolkata, which is considered as the educational hub of Eastern India, NCPT has gained prominence since its inception. NCPT is under the aegis of NSHM Knowledge Campus, Kolkata Group of Institutions. "In 2005, NCPT formerly known as H. C. Garg Institute of Pharmaceutical Sciences and Technology started its journey with only 12 B. Pharm students," states Dr.SubhasisMaity, Director, NCPT. Currently, its B. Pharm course has two full divisions, each having an intake capacity of 60. The institute offers postgraduate program in two disciplines namely M. Pharm in Pharmaceutics and M. Pharm in Pharmacology. NCPT has a robust infrastructure to give students the best in terms of theoretical and practical learning. The infrastructural facility of the institute is comparable to the best pharmacy colleges in the country. "We have spacious class rooms , well designed laboratories, state of the art seminar halls, a library with rich holding of books, animal house, advanced research labs , herbal garden and it is our intellectual capital which sets us ahead of other institutions," claims Dr. Maity. A high point of NCPT is its research capability. Over the years, the institute has been continuously enhancing its capabilities for high quality research through training, collaboration with pharmaceutical companies, seminars and conferences. The institute organizes a national conference 'NATCONPH' every year in the month of February or March. To keep the members abreast of the latest development in the field of research, the library subscribes to more than 25 pharmaceutical research journals and to the Bentham database. "We are running two DST funded projects now and a collaborative research with Emami Private limited is right now on process," adds Dr. Maity. NCPT adopts a holistic approach in grooming the students to become successful professionals. A great deal of importance is given to hands-on learning. Students are encouraged to think out of the box and express their creativity in arts and culture. Seminars and guest lectures are organized on a regular basis to keep the students updated about recent developments of the profession. NCPT maintains a coordinator or mentorship system where an educator is given the overall responsibility of a group of students. To improve the employability of the students, NCPT has an excellent team of faculty members, which is a judicious mix of experts from both industry and academia. "Almost 80 percent of the 32 teaching faculty have Ph.D and others are in the process of acquiring the same," adds Dr. Maity. The institute is affiliated to MaulanaAbulKalam University of Technology (earlier West Bengal University of Technology) and admission to its undergraduate course is through joint entrance examination. The institute's excellent teaching-learning environment usually attracts top ranking students. "Recently, the sustained efforts of NCPT to create a centre of excellence have been rewarded by NBA accreditation of its B. Pharm program--a rare honor for a self-financing institute," says Dr.Maity. All these concerted efforts of NCPT in grooming students is reflected in its placement record as well as excellent results in national level competitive examinations like GPAT, CAT, GATE and NIPER. Tie-ups are there with important industries and approximately 90 percent of the students find placement through campus interviews. A sizeable number of students are also pursuing higher studies in reputed institutes of India and abroad. A number of worthy entrepreneurs have started their journey from NSHM where able mentors have guided them. With its vast expertise in the field, the institute is making hundreds of students realize their goals through Pharmacy specialized courses and Pharmacy oriented interactive workshops related to GMP, GLP, ISO, entrepreneurship development, business case-studies, pharmaceutical marketing, research programs, different trainings and management development programs, which are suitably fabricated for taking care of the personal development of every student. "Though, the institute has registered a phenomenal growth over a decade, now NCPT is determined to produce a new breed of leaders in the arena of pharmaceutical profession," concludes Dr. Maity. 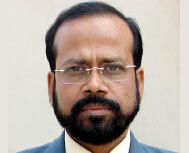 He has been inculcating the skills for thinking and creativity based learning in the MHA students since long. Since then he has been engaged in research activities related to the field of Healthcare Management & Pharmaceutical Technology. He is an Inspector of PCI, New Delhi and Ex-Controller of Examinations, West Bengal University of Technology and a member of the various committees of WBUT & AICTE. He works on different projects from Bombay Hospital & Medical Research Centre and Kothari Medical Centre, Kolkata. He had a fair stint with the healthcare industries on focus-based environment, designed for the new breed of MHA students to derive meaningful engagements in the demanding sectors under the Healthcare industry as a whole.